An oocyst (G. ōon, egg + kystis, bladder) is a hardy, thick-walled spore, able to survive for lengthy periods outside a host. 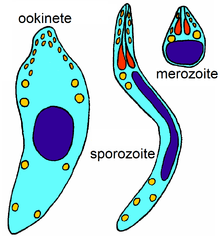 The zygote develops within the spore, which acts to protect it during transfer to new hosts. 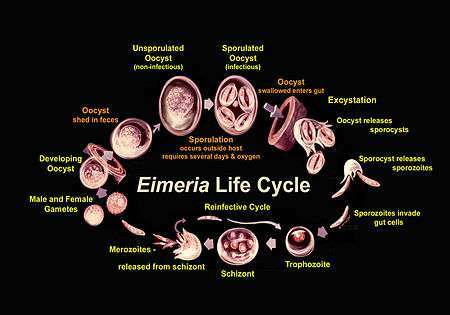 Organisms that create oocysts include Eimeria, Isospora, Cryptosporidium, and Toxoplasma. ↑ "Schizogony definition". MSN Encarta. Retrieved 2009-12-11. ↑ Herwaldt; Persing, DH; Précigout, EA; Goff, WL; Mathiesen, DA; Taylor, PW; Eberhard, ML; Gorenflot, AF; et al. (1 April 1996). "A Fatal Case of Babesiosis in Missouri: Identification of Another Piroplasm That Infects Humans". Annals of Internal Medicine. 124 (7): 643–650. doi:10.1059/0003-4819-124-7-199604010-00004. PMID 8607592. Retrieved 2009-12-11. ↑ Zhou, M.; Liu, Q.; Wongsrichanalai, C.; Suwonkerd, W.; Panart, K.; Prajakwong, S.; Pensiri, A.; Kimura, M.; et al. (6 January 2002). "High prevalence of Plasmodium malariae and Plasmodium ovale in malaria patients along the Thai-Myanmar border, as revealed by acridine orange staining and PCR-based diagnoses". Tropical Medicine & International Health. 3 (4): 304–312. doi:10.1046/j.1365-3156.1998.00223.x. Retrieved 2009-12-11. 1 2 James Desmond Smyth, Derek Wakelin (1994). Introduction to animal parasitology (3 ed.). Cambridge University Press. pp. 101–102. ISBN 0-521-42811-4. 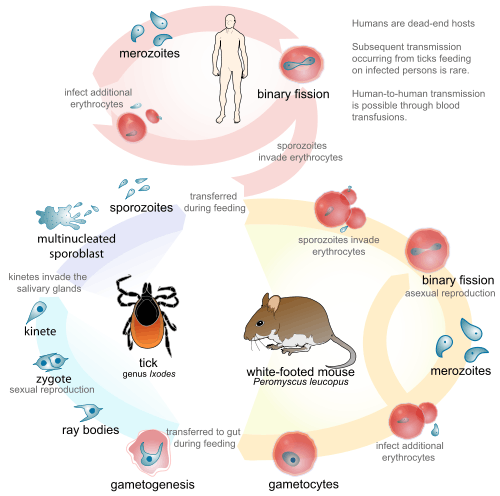 ↑ "Malaria - Life Cycle Of Plasmodium.swf". esnips. Archived from the original on 21 November 2009. Retrieved 2009-12-11. ↑ "Schizozoite", Farlex Partner Medical Dictionary, 2012, A merozoite before schizogony, as in the exoerythrocytic phase of the development of the Plasmodium agent after sporozoite invasion of the hepatocyte and before multiple division. ↑ Sinden, R. E.; Talman, A.; Marques, S. R.; Wass, M. N.; Sternberg, M. J. E. (2010). 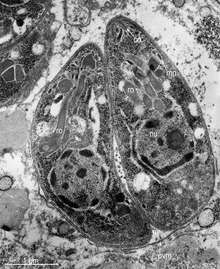 "The flagellum in malarial parasites". Current Opinion in Microbiology. 13 (4): 491–500. doi:10.1016/j.mib.2010.05.016. PMID 20566299. ↑ "Ookinete (Medical Dictionary)". Dictionary.com. Retrieved 2009-12-11.